Louise Libersat was born on April 16, 1917 in Abbeville. Her parents were Elmick Theriot and Celima Soirez. She was the oldest for four children. Her siblings were Emick Theriot (deceased), Stella Menard (deceased) and Louell Mouton. She graduated from Henry High School in May 1935. She worked as a store clerk until she married Paul Libersat in May 1937. They had four children, Nolan, Marie (who died in infancy), Gerald and Gayle. She did various jobs over the years, such as a store clerk, chauffeur, bus driver and ironing for 11 families. In the 1950’s, she drove a truck for a team of Henry boys who picked up hay for the farmers of the area. In order to make ends meet for her young family, she picked cotton with her children. With the money raised over the years, she was able to purchase her first refrigerator, a bike for her daughter Gayle and a trumpet for her son Gerald. 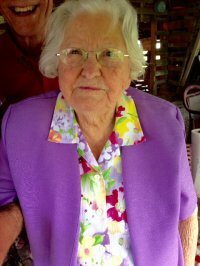 She set a terrific example of Cajun traditions for her family–and her community. When her children were in school, she was a very active participant in all events, such as bank, basketball, and social events. As a long-time member of the St. John Catholic Church, Louise was one of the community’s most dedicated member of the Catholic family. Since the opening of the Acadian Museum in 1991, Louise has been one of its most loyal supporters and contributors. She has always found the time to attend all of the museum’s functions and events.